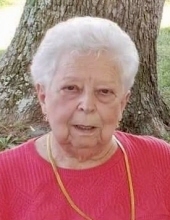 Margaret Ellen Tart Lee, age 82 of Lane Road, Dunn, NC, died on Sept.12, 2018, at her residence. Funeral services will be held Wednesday, Sept. 19th at the First Presbyterian Church of Dunn at 2pm. Visitation with the family will be one hour prior to the service, beginning at 1pm. Margaret was a resident of Harnett County all her life and was born the daughter of the late George E. Tart and Hettie Hayes Tart. She graduated from Dunn High School in 1953. She had a long and distinguished career as a Secretary to several organizations and individuals in and around Dunn. Her last public job was as secretary to the First Presbyterian Church of Dunn, having worked there from 1987 to 1998. She was a member of Dunn Chapter #59 Order of the Eastern Star, the Dunn Woman’s Club, and a lifelong member of the Presbyterian Church, having served in many capacities. Perhaps her most important work was her service, love, and commitment to her family, church, and friends. Survivors include her husband of 65 years, Jerry F. Lee; two daughters, Marsha Lee Johnson (Tommy) and Lorie Lee Allen (Bennett), both of Dunn; a son, Brian F. Lee, of St. Cloud, Florida; one brother, George F. Tart of Dunn. She had five grandchildren - Adrienne Hester, Allison Hunnicutt, Wesley Johnson, Davis Allen, and Garrett Allen; and 4 great-grandchildren. In lieu of flowers, contributions may be made to the First Presbyterian Church, 901 North Park Avenue, Dunn, NC 28334. Arrangements are by Skinner & Smith Funeral Home of Dunn. To send flowers or a remembrance gift to the family of Margaret Tart Lee, please visit our Tribute Store. "Email Address" would like to share the life celebration of Margaret Tart Lee. Click on the "link" to go to share a favorite memory or leave a condolence message for the family.